It was with such mixed feelings that we finally threw our lines off at the Marina at Ortega Landing and pointed our bow north. We had stayed there longer than we have ever stayed in one place and it was certainly beginning to feel like "home." It was sad to leave friends both old and new. 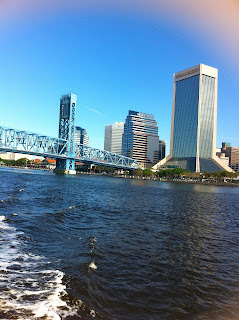 Not to mention our personal Publix and many restaurants we came to love. We won trivia night twice at Tom and Betty's and should have won a third time but Jeff, well, that's another story. The whole crew had a wonderful time and we look forward to returning. Our original plans were to leave by the weekend but there was a perfect weather window on Thursday and the weather was falling part after that until next week, so off we went. In fact we were part of a flotilla as Al and Bette on Plane to Sea took advantage of the same window and Paul and Dinny on Carry On used it to calibrate their instruments. It was a terrific day offshore as we headed to Cumberland Island to anchor for a week. This is most definitely on our list of all time favorite anchorages. The island is wild and beautiful and has the most magnificent beach on the ocean side. 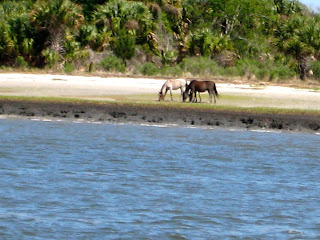 As soon as we rounded the island from the inlet we saw some of Dyna and Dylan's old buddies, the wild horses that live on the island. If you've followed the kids for some time you may remember the up close and personal encounter they had the first time we went ashore on the island. You can see the video here. It's now Friday afternoon and the winds are starting to howl. Jeff is a little anxious as we had to drop the anchor 4 times before we were satisfied with the holding. It'll be a good test for DragQueen (our anchor alarm for iPhone and Android). We have a few days of poor weather and then the crew will disembark for jaunts on the island and who knows, maybe another meeting with the wild horses of Cumberland Island.